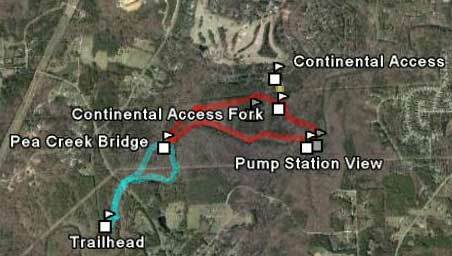 Eastern Eno River State Park — Parking for the eastern trails can be found at the end of Old Cole Mill Road which branches off the much large Cole Mill Road. Most GPS systems including google maps does not have this location. 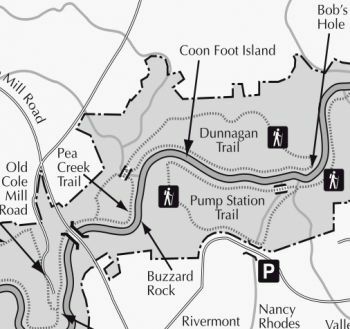 Through this trail head you will enter the Pea Creek Trail which can be extended by the Dunnagan Trail. Continental Road Access – Limited parking is available here; however, it is an excellent option if one wishes to hike only the Dunnagan Trail. 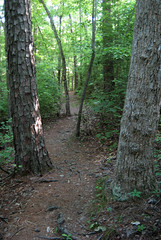 Both of these trails include a southern leg that parallels the Eno River and a northern leg through more upland forests. Pea Creek Trail — This trail, blazed with blue dots, starts at the most southern end of the Eastern Trails parking lot. Multiple trails start here and well marked signs eliminate confusion. 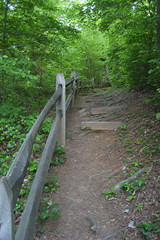 The Pea Creek trail descends down multiple steps to the river. 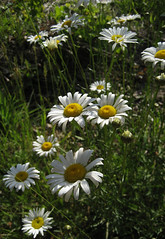 Flowers are commonplace. The beauty is temporarily interrupted by an early crossing under the Cole Mill Road Bridge. 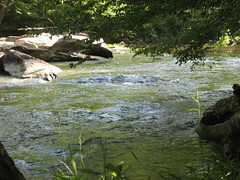 The trail turns to the north where Pea Creek enters the Eno. By *not* crossing the bridge, the hiker will return through the forest to complete the loop. By crossing the Pea Creek Bridge (an example of a well-done Eagle Scout project), this trail can be extended to the Dunnagan trail. Dunnagan Trail — Blazed with red dots, the riverside portion of this trail gives the hiker another 3/4 of a mile of Eno. Before the trail turns away from the river, the stone wall remains of Durham’s first water pumping station are visible across the river. A deep area of the river known as Bob’s Hole is also found in this area. After climbing up the ridge to the northwest for the loop back, the short Continental Access trail heads north while the trail stays on the ridge to the west. An eerie shaded clearing filled with ferns, stones, and flowers is apparent on the inside of the loop from this upper ridge. A tiny sunken cemetery, which includes Catherine Dunnagan’s headstone, provides mystery and reflection to this experience. You have a keen eye. Great images! Your blog is very useful with helpful information. I will come back to your blog for places to take my kids. I’m a city kid so, I’m a novice at hiking. 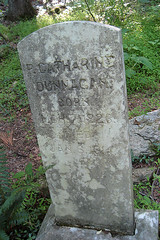 I would like to know more about Cathrine Dunnagan-are there more headstones? No more headstones that I remember. A few more graves with footstones. I did a brief google search but couldn’t find out much more additional information. Let us know if you find out anything else.